Lieutenant Colonel Ardeshir Burzorji Tarapore was born on August 18, 1923 in Mumbai. He belongs to the family of General Ratanjiba who led the army of Chatrapati Shivaji Maharaj, who was awarded 100 villages of which Tarapore was main village. The name Tarapore comes for the same reason. Later his grandfather relocated to Hyderabad and started working under the excise department of Nizam of Hyderabad. After his death Burzonji took up his father's job and was comparatively successful due to his hardwork. From the young tender age Ardeshir's showed his courage when he saved his sister, Yadgar, from a family cow that had broken loose. By the time he was seven years old he was sent to the Sardar Dastur Boys' Boarding School, Pune. He completed his matriculation in the year 1940. After school he applied for the army and was selected. he did his initial training in the Officers' Training School at Golconda and on completion was sent to Bangalore. He saw himself commissioned in the 7th Hyderabad Infantry as a Second Lieutenant. He was popularly known as 'Adi'. Adi was not very happy joining the infantry, instead he wanted to join an armoured regiment. On one fine day his battalion was inspected by Major General El Edroos, the Commander-in-Chief of the state forces. At the grenade throwing range due to an accident a grenade fell into the bay area. Adi was quick to jump and throw it. However the grenade exploded in the middle which left him injured as the flying shapnel hit his chest. Major General Edroos, was a witness to this event which kept him spellbound. He was impressed by the exemplary courage displayed by Ardeshir. Major General Edroos summoned Ardeshir to his office and congratulated him for his efforts. Ardeshir took this as an opportunity and requested that he be transferred to an armoured regiment. The General accepted this and he was transferred to the 1st Hyderabad Imperial Service Lancers. Interestingly, 1st Hyderabad Lancer fought with The Poona Horse in Operation Polo. <?xml:namespace prefix = o />The biggest tank battle of the 1965 Indo-Pak War took place at Phillora in the Sialkot sector at the Battle of Chawinda. During the southern thrust of the Indian Army on the Kaloi-Phillora axis the 17 Horse commanded by Lt. Col. Tarapore advanced on the right flank. On 11 September 1965, the regiment was assigned the task of delivering the main armoured thrust for capturing Phillora. It decided upon launching a surprise attack on Phillora from the rear. To achieve the surprise, when the regiment was thrusting forward between Phillora and Chawinda, it was suddenly counter-attacked by the Pakistani Army's heavy armour from Wazirwali. Lt. Col. Tarapore defied the Pakistani Army's charge, held his ground and gallantly attacked Phillora with one of his squadrons supported by an Infantry battalion. Though under continuous enemy tank and artillery fire, he remained unperturbed throughout this action. When wounded, he refused to be evacuated. On 14 September 1965, he led his regiment to capture Wazirwali. Inspired by his leadership, the regiment fiercely attacked the enemy armour and destroyed approximately sixty Pakistani Army tanks, suffering only nine tank casualties. However, Lt. Colonel Tarapore was enveloped in flames and died a hero's death. The valour displayed by him in this action, lasting 6 days, was in keeping with the highest traditions of the Indian Army. 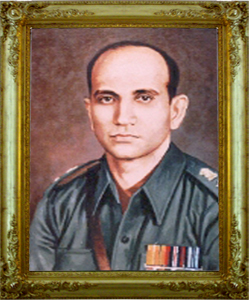 Lieutenant Colonel Ardeshir Burzorji Tarapore was awarded with the highest war-time gallantry medal, Param Vir Chakra, posthumously. Major Aga Humayun Khan & Major Shamshad of Pakistan Army in their article on Battle of Chawinda,which was published in Defense Journal had described Lt. Col Tarapore as a tough & brave opponent, who inspired & led the 17th Poona Horse bravely throughout the battle.